The Italy national football team (Italian : Nazionale di calcio dell'Italia) has officially represented Italy in association football since their first match in 1910. The squad is under the global jurisdiction of FIFA and is governed in Europe by UEFA—the latter of which was co-founded by the Italian team's supervising body, the Italian Football Federation (FIGC). Italy's home matches are played at various stadiums throughout Italy, and their primary training ground is located at the FIGC headquarters in Coverciano, Florence. The 1934 FIFA World Cup was the second FIFA World Cup, the world championship for men's national association football teams. It took place in Italy from 27 May to 10 June 1934. The 1938 FIFA World Cup was the third staging of the World Cup, and was held in France from 4 to 19 June 1938. Italy retained the championship by beating Hungary 4–2 in the final. Italy's 1934 and 1938 teams became the only ones to have won two World Cups under the same coach, Vittorio Pozzo. 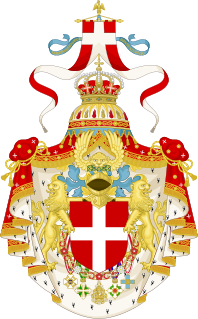 The House of Savoy is a royal family that was established in 1003 in the historical Savoy region. Through gradual expansion, the family grew in power from ruling a small county in the Alps north-west of Italy to absolute rule of the kingdom of Sicily in 1713 to 1720. Through its junior branch, the House of Savoy-Carignano, it led the unification of Italy in 1861 and ruled the Kingdom of Italy from 1861 until 1946 and, briefly, the Kingdom of Spain in the 19th century. The Savoyard kings of Italy were Victor Emmanuel II, Umberto I, Victor Emmanuel III, and Umberto II. The last monarch ruled for a few weeks before being deposed following the Constitutional Referendum of 1946, after which the Italian Republic was proclaimed. The Kingdom of Italy was a state which existed from 1861—when King Victor Emmanuel II of Sardinia was proclaimed King of Italy—until 1946—when civil discontent led a constitutional referendum to abandon the monarchy and form the modern Italian Republic. 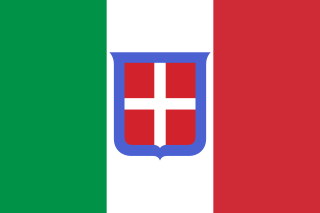 The state was founded as a result of the unification of Italy under the influence of the Kingdom of Sardinia, which can be considered its legal predecessor state. The Brazil–Italy football rivalry, also known as the Clásico Mundial in Spanish or the World Derby in English, is a football rivalry between the national football teams of Brazil and Italy, two of the most successful football nations in the world, having achieved nine World Cups between the two countries. They have played against each other five times in the World Cup. Most notably, the 1970 World Cup Final and the 1994 World Cup final in which Brazil won 4–1, and 3–2 on penalties after a goalless draw, respectively, as well as the semifinals of the 1938 World Cup and the final second group stage match of the 1982 World Cup won 3–2 by Italy. They have also met at two FIFA Confederations Cups as well as the 1976 U.S.A. Bicentennial Cup Tournament and the 1997 Tournoi de France. Pietro "Piero" Lana was an Italian professional footballer, who played as a striker. In 1910, he scored the first ever goal of the Italy national football team. Football was one of the tournament at the 1928 Summer Olympics. It was won by Uruguay against Argentina, and was the last Olympic football tournament before the inception of the FIFA World Cup, which was held for the first time in 1930. The Uruguay national football team represents Uruguay in international association football and is controlled by the Uruguayan Football Association, the governing body for football in Uruguay. The current head coach is Óscar Tabárez. The Uruguayan team is commonly referred to as La Celeste . They have won the Copa América 15 times, the most successful national team in the tournament, the most recent title being the 2011 edition. The team has won the FIFA World Cup twice, including the first World Cup in 1930 as hosts, defeating Argentina 4–2 in the final. They won their second title in 1950, upsetting host Brazil 2–1 in the final match, which received an attendance higher than any football match ever. Vittorio Pozzo was an Italian football manager, player and journalist. Giuseppe "Peppino" Meazza, also known as il Balilla, was an Italian football manager and player. Throughout his career, he played mainly for Internazionale in the 1930s, scoring 242 goals in 365 games for the club, and winning three Serie A titles, as well as the Coppa Italia; he later also played for local rivals Milan, as well as Turin rivals Juventus, in addition to his spells with Varese and Atalanta. At international level, he led Italy to win two consecutive World Cups: in 1934 on home soil, and in 1938 as captain; he was named to the All-star Team and won the Golden Ball Award at the 1934 World Cup, as the tournament's best player. Along with Giovanni Ferrari and Eraldo Monzeglio, he is one of only three Italian players to have won two World Cups. Following his retirement, he served as a coach for the Italy national team, and with several Italian clubs, including his former club sides Inter and Atalanta, as well as Pro Patria, and Turkish club Beşiktaş; he was Italy's head coach at the 1952 Summer Olympics. 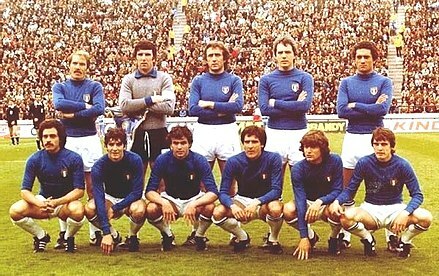 In 1968, Italy participated in their first European Championship, hosting the European Championship and winning their first major competition since the 1938 World Cup, beating Yugoslavia in Rome for the title. The match holds the distinction of being the only European Championship or World Cup final to go to a replay. 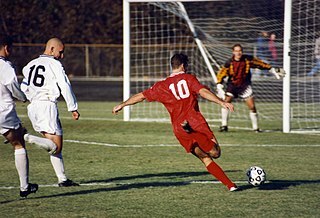 After extra time the final ended in a 1–1 draw, and in the days before penalty shootouts, the rules required the match to be replayed a few days later. Italy won the replay 2–0 (with goals from Luigi Riva and Pietro Anastasi) to take the trophy. In the 1970 World Cup, exploiting the performances of European champions' players like Giacinto Facchetti, Gianni Rivera and Luigi Riva and with a new center-forward Roberto Boninsegna, the team were able to come back to a World Cup final match after 32 years. They reached this result after one of the most famous matches in football history—the "Game of the Century", the 1970 World Cup semifinal between Italy and Germany that Italy won 4–3 in extra time, with five of the seven goals coming in extra time. They were later defeated by Brazil in the final 4–1. The cycle of international successes ended in the 1974 World Cup, when the team was eliminated by Grzegorz Lato's Polish team in the first round. In the 1978 FIFA World Cup in Argentina, a new generation of Italian players, the most famous being Paolo Rossi, came to the international stage. Italy were the only team in the tournament to beat the eventual champions and host team Argentina. Second-round games against West Germany (0–0), Austria (1–0) and Netherlands (1–2) led Italy to the third-place final, where the team was defeated by Brazil 2–1. In the match that eliminated Italy from the tournament against the Netherlands, Italian goalkeeper Dino Zoff was beaten by a long-distance shot from Arie Haan, and Zoff was criticized for the defeat. Italy hosted the 1980 UEFA European Football Championship, the first edition to be held between eight teams instead of four,  automatically qualifying for the finals as hosts. After two draws with Spain and Belgium and a narrow 1–0 win over England, Italy were beaten by Czechoslovakia in the third-place match on penalties 9–8 after Fulvio Collovati missed his kick. After a scandal in Serie A where some National team players such as Paolo Rossi  were prosecuted and suspended for match fixing and illegal betting, the Azzurri qualified for the second round of the 1982 World Cup after three uninspiring draws against Poland, Peru and Cameroon. Having been loudly criticized, the Italian team decided on a press black-out from then on, with only coach Enzo Bearzot and captain Dino Zoff appointed to speak to the press. Italy's regrouped in the second round group, a group of death with Argentina and Brazil. In the opener, Italy prevailed 2–1 over Argentina, with Italy's goals, both left-footed strikes, were scored by Marco Tardelli and Antonio Cabrini. After Brazil defeated Argentina 3–1, Italy needed to win in order to advance to the semi-finals. Twice Italy went in the lead with Paolo Rossi's goals, and twice Brazil came back. When Falcão scored to make it 2–2, Brazil would have been through on goal difference, but in the 74th minute Rossi scored the winning goal, for a hat-trick, in a crowded penalty area to send Italy to the semifinals after one of the greatest games in World Cup history. Italy then progressed to the semi final where they defeated Poland with two goals from Rossi. The summer of 2004 marked the choice, by FIGC, to appoint Marcello Lippi for Italy's bench. He made his debut in an upset 2–0 defeat in Iceland  but then managed to qualify for 2006 World Cup. Italy's campaign in the tournament hosted by Germany was accompanied by open pessimism  due to the controversy caused by the 2006 Serie A scandal,  however these negative predictions were then refuted, as the Azzurri eventually won their fourth World Cup. Marcello Lippi stepped down after Italy's World Cup campaign and was replaced by Cesare Prandelli, although Lippi's successor had already been announced before the tournament. Italy began their campaign with Prandelli with a disappointing 0–1 loss to the Ivory Coast in a friendly match. Then, during a Euro 2012 qualifier, Italy came back from behind to defeat Estonia 2–1. In the next Euro qualifier, Italy dominated the Faroe Islands 5–0. Italy then tied 0–0 with Northern Ireland. 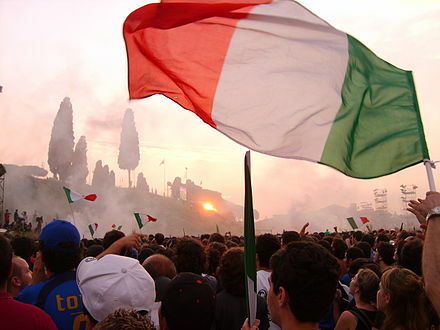 Five days later, Italy played Serbia; however, Serbian fans in Stadio Luigi Ferraris began to riot, throwing flares and shooting fireworks onto the pitch, subsequently causing the abandonment of the game. Upon UEFA Disciplinary Review, Italy was awarded a 3–0 victory that propelled them to the top of their group. In their first match of 2011, Italy drew 1–1 a friendly with Germany at Dortmund, in the same stadium where they beat Germany 2–0 to advance to the final of the 2006 World Cup. In March 2011, Italy won 1–0 over Slovenia to again secure its spot at the top of the qualification table. They then defeated Ukraine 2–0 in a friendly, despite being reduced to ten men for the late stages of the match. With their 3–0 defeat of Estonia in another Euro 2012 qualifier, Prandelli's Italy secured the table lead and also achieved 9 undefeated games in a row since their initial debacle. The streak was ended on 7 June 2011 by Trapattoni's current charges, the Republic of Ireland, with Italy losing 0–2 in a friendly in Liège. In their next game, the first semi-final of the competition, they faced Germany team who were tipped by many to be the next European champions. However, two first-half goals by Mario Balotelli saw Germany sent home, and the Italians went through to the finals to face the title defenders Spain. During the 2013 Confederations Cup in Brazil, Italy started in a group with Mexico, Japan and Brazil. After beating Mexico 2–1 and Japan 4–3, Italy eventually lost their final group game against tournament hosts Brazil 4–2. Italy then faced Spain in the semi-finals, in a rematch of the Euro 2012 final. Italy lost 7–6 (0–0 after extra time) in a penalty shoot-out after Leonardo Bonucci failed to score his kick. Prandelli was praised for his tactics against the current World Cup and European champions. Italy was then able to win the match for the third place by defeating Uruguay with the penalty score of 5–4 (2–2 after extra time). Wikimedia Commons has media related to Italy national football team kits . The first known kit manufacturer was Adidas in 1974. Since 2003, the kit has been made by Puma. Since the 2000s, an all-blue uniform including blue shorts has occasionally been used, particularity in international tournaments. After Italy's 2006 World Cup victory, a fourth star was added to the tricolour badge. ↑ This edition of the tournament was interrupted due to the annexation of Austria to Nazi Germany on 12 March 1938. Dino Zoff is an Italian former professional football goalkeeper and is the oldest ever winner of the World Cup, which he earned as captain of the Italian national team in the 1982 tournament in Spain, at the age of 40 years, 4 months and 13 days, also winning the award for best goalkeeper of the tournament, and being elected to the team of the tournament for his performances, keeping two clean-sheets, an honour he also received after winning the 1968 European Championship on home soil; he is the only Italian player to have won both the World Cup and the European Championship. Zoff also achieved great club success with Juventus, winning 6 Serie A titles, 2 Coppa Italia titles, and an UEFA Cup, also reaching two European Champions' Cup finals in the 1972–73 and 1982–83 seasons, as well as finishing second in the 1973 Intercontinental Cup final. Franco Baresi is an Italian football youth team coach and a former player and manager. He mainly played as a sweeper or as a central defender, and spent his entire 20-year career with Serie A club Milan, captaining the club for 15 seasons. He is considered one of the greatest defenders of all-time and was ranked 19th in World Soccer magazine's list of the 100 greatest players of the 20th century. With Milan, he won three UEFA Champions League titles, six Serie A titles, four Supercoppa Italiana titles, two European Super Cups and two Intercontinental Cups. Gianluigi Buffon, commonly shortened to Gigi Buffon, is an Italian professional footballer who plays as a goalkeeper for French club Paris Saint-Germain. He is widely regarded by players, pundits and managers as one of the greatest goalkeepers of all time, and, by some, as the greatest ever. Alessandro Nesta is an Italian professional football manager and former player. He is currently the head coach of Perugia. Roberto Donadoni is an Italian football manager and former midfielder, who was last manager of Bologna. Dino Baggio is an Italian former professional footballer who played as a defensive midfielder. Demetrio Albertini is the sporting director of Parma and a former professional Italian football midfielder and vice-president of the Italian Football Federation (FIGC). He is widely considered as one of the legends of the A.C. Milan side of the 90s and a fundamental player for the Italian national team of the same period. He spent most of his career with Milan of the Italian Serie A, winning many trophies, including five Serie A titles and two UEFA Champions League titles with the club. He also played his final season for FC Barcelona, winning the Spanish League before retiring that year. Daniele De Rossi is an Italian professional footballer who plays as a defensive midfielder for Roma and formerly the Italy national team. De Rossi inherited the captaincy of Roma at the start of the 2017–18 season following the retirement of Francesco Totti. Luca Toni is an Italian retired professional footballer who played as a striker. He also was a sporting director for Verona. Andrea Barzagli is an Italian professional footballer who plays as a centre-back for Juventus. 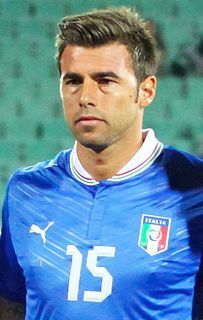 A four-time member of the Serie A Team of the Year, Barzagli is regarded as one of the best and most consistent defenders of his generation. Fabio Grosso is an Italian professional football manager and a former player, who played as a left-back. He is the current manager of Hellas Verona. Francesco "Ciccio" Graziani is an Italian football manager and former football player who played as a forward. Giorgio Chiellini is an Italian professional footballer who plays as a defender and is the captain of Juventus and the Italy national team. Chiellini is considered to be one of the best defenders in the world. A physically strong, aggressive, and versatile defender, although he is usually deployed as a centre-back, he is also capable of playing as a left-back, both in a three or four-man defence. Salvatore Sirigu born 12 January 1987) is an Italian professional footballer who plays as a goalkeeper for Torino and the Italy national team. Antonio Candreva is an Italian professional footballer who plays as a midfielder or winger for Internazionale and the Italian national team. Federico Marchetti is an Italian professional footballer who plays as a goalkeeper for Genoa and the Italy national team. Melania Gabbiadini is an Italian former football forward. After beginning her career with Bergamo in 2000, she later joined AGSM Verona in 2004 and went on to captain the team, until her retirement in 2017. She won five Scudetti with the club. The Germany–Italy football rivalry between the national football teams of Germany and Italy, the two most successful football nations in Europe and only behind Brazil internationally, is a long-running one. Overall, the two teams have won eight FIFA World Cup championships and made a total of 14 appearances in the final of the tournament – more than all the other European nations combined. They have played against each other five times in the World Cup, and many of these matches have been notable in the history of the tournament. The "Game of the Century", the 1970 semifinal between the two countries that Italy won 4–3 in extra time, was so dramatic that it is commemorated by a plaque at the entrance of the Estadio Azteca in Mexico City. Germany has also won three European Championships while Italy has won it once. The two countries have faced each other four times in the European championship, with three draws and one Italian victory. The history of the Italy national football team began in 1910, when Italy played its first international match. Since then, the Italy national team has been one of the most successful football teams, winning four World Cups and one European Championships. This article lists various football records and statistics of the Italy national football team. ↑ "Album della stagione" (in Italian). MagliaRossonera.it. Retrieved 15 June 2010. ↑ "Pietro Lana" (in Italian). MagliaRossonera.it. Retrieved 15 June 2010. ↑ "FIGC". Figc.it. Retrieved 21 April 2012. ↑ "Italia-Francia IL CALCIO" (PDF) (in Italian). repubblica.it. 17 October 2006. ↑ "1st International Cup". www.rsssf.com. ↑ "3rd International Cup". www.rsssf.com. ↑ "Football at the 1936 Berlin Summer Games". Sports Reference. Retrieved 7 October 2018. ↑ "Giuseppe Meazza La favola di Peppin il folbèr" (in Italian). Storie di Calcio. Retrieved 27 April 2016. ↑ "The inimitable Giuseppe Meazza". FIFA.com. Retrieved 27 April 2016. ↑ Martin, Simon (1 April 2014): "World Cup: 25 stunning moments … No8: Mussolini's blackshirts' 1938 win". theguardian.com. Läst 22 April 2016. ↑ "1966 World Cup: Football comes home". cbc.ca. 26 November 2009. ↑ "1966: Portugal - Korea DPR". yahoo.com. 16 May 2006. Archived from the original on 16 May 2006. ↑ Sam Sheringham (12 May 2012). "Euro 1968: Alan Mullery's moment of madness". bbc.com. Retrieved 27 April 2016. ↑ Matt Wagg (28 June 2012). "Euro 2012: five classic tournament matches between Germany and Italy including the 'Game of the Century'". telegraph.co.uk. Retrieved 27 April 2016. ↑ "Classic Football: Dino Zoff – I was there". FIFA Official Site. Retrieved 27 April 2016. ↑ "1980 at a glance". uefa.com. 1 July 2011. Retrieved 27 April 2016. ↑ Dan Warren (25 July 2006). "The worst scandal of them all". BBC News . Archived from the original on 23 March 2012. Retrieved 21 May 2010. ↑ Duarte, Fernando (30 May 2014). "Brazil lost that Italy game in 1982 but won a place in history – Falcão". The Guardian. Retrieved 27 April 2016. ↑ Wilson, Jonathan (25 July 2012). "Italy 3–2 Brazil, 1982: the day naivety, not football itself, died". The Guardian. Retrieved 27 April 2016. ↑ Lewis, Tim (11 July 2014). "1982: Why Brazil V Italy Was One Of Football's Greatest Ever Matches". Esquire. Archived from the original on 27 September 2015. Retrieved 27 April 2016. ↑ "Marco Tardelli" (in Italian). Storie di Calcio. Retrieved 27 April 2016. ↑ "Paolo Rossi: La solitudine del centravanti" (in Italian). Storie di Calcio. Retrieved 4 July 2015. ↑ "World Cup Hall of Fame: Dino Zoff". Sports Illustrated . Archived from the original on 12 September 2005. ↑ Almanacco Illustrato del Calcio 1984 (in Italian). Panini Group. 1983. p. 393. ↑ Gianni Brera (23 May 1984). "Italia-Germania Che noia mundial!". la Repubblica (in Italian). p. 37. ↑ Mario Sconcerti (26 September 1985). "L' Italia s' è persa". la Repubblica (in Italian). p. 27. ↑ Gianni Brera (17 November 1985). "Ma per l' Italia altri cento di questi giorni..." la Repubblica (in Italian). p. 25. ↑ Fabrizio Bocca (6 February 1986). "E ora Beckenbauer pensa alla grande". la Repubblica (in Italian). p. 18. ↑ Mario Sconcerti (18 June 1986). "Povero Bearzot". la Repubblica (in Italian). p. 1. ↑ "Alla ricerca dell' Italia perduta". la Repubblica (in Italian). 3 August 1986. p. 26. ↑ "Quante novità nell'anno di Vicini". la Repubblica (in Italian). 12 June 1987. p. 45. ↑ Gianni Mura (15 November 1987). "Viva Vialli". la Repubblica (in Italian). p. 22. ↑ Gianni Brera (21 February 1988). "Abbracciati a Vialli". la Repubblica (in Italian). p. 21. ↑ Gianni Brera (25 June 1988). "Questa URSS non è perfetta". la Repubblica (in Italian). p. 23. 1 2 "Italy oust Brazil to take top spot". FIFA.com. 14 February 2007. Archived from the original on 2 February 2017. ↑ "Match Report – 1994 FIFA World Cup USA (TM): Nigeria – Italy". FIFA.com. Archived from the original on 16 December 2011. Retrieved 18 December 2011. ↑ "Match Report – 1994 FIFA World Cup USA (TM): Italy – Spain". FIFA.com. Archived from the original on 19 December 2011. Retrieved 18 December 2011. ↑ "Match Report – 1994 FIFA World Cup USA (TM): Bulgaria – Italy". FIFA.com. Archived from the original on 19 December 2011. Retrieved 18 December 2011. ↑ "USA 94". news.bbc.co.uk. 17 April 2002. ↑ "Divine by moniker, divine by magic". fifa.com. Retrieved 27 April 2016. ↑ "ci resta un filo di Baggio" (in Italian). Il Corriere della Sera. 15 July 1994. Retrieved 27 April 2016. ↑ "Has so much ever hung on a hamstring? – Roberto Baggio, Italy's Footballing Hero". The Independent. London. 16 July 1994. Retrieved 27 April 2016. ↑ "e Baggio sbaglia il tiro della sua vita" (in Italian). Il Corriere della Sera. 18 July 1994. Retrieved 27 April 2016. ↑ "Da Baggio a McEnroe e Schumi Come si sbaglia un punto decisivo" (in Italian). Il Corriere della Sera. 31 October 2006. Retrieved 27 April 2016. ↑ "Italy pay penalty for Germany stalemate". UEFA.com. 6 October 2003. Retrieved 7 July 2016. ↑ "World Cup 2018: Italy and the nightmare of their play-off against Sweden". bbc.com. 10 November 2017. ↑ "10 Leggende Mondiali" [10 World Cup Legends] (in Italian). Eurosport. Retrieved 27 April 2016. ↑ "Angry Italy blame 'conspiracy'". Soccernet. 19 June 2002. Archived from the original on 23 November 2006. Retrieved 6 August 2006. ↑ Ghosh, Bobby (24 June 2002). "Lay Off the Refs". Time. Retrieved 28 April 2010. ↑ "Fifa investigates Moreno". BBC News. 13 September 2002. ↑ "Blatter condemns officials". BBC News. 20 June 2002. ↑ "Flachi, Toni and Blasi here's Lippi's news". repubblica.it (in Italian). 14 August 2004. ↑ "Bad debut for Lippi Italy knocked out in Iceland". repubblica.it (in Italian). 18 August 2004. ↑ "Bitter Slovenia for Italy who loses match and top". repubblica.it (in Italian). 9 October 2004. ↑ Enrico Currò (14 October 2004). "Qualificazioni mondiali". la Repubblica (in Italian). p. 50. ↑ "People's Daily Online – Scandal threatening to bury Italy's Cup dream". English.people.com.cn. 23 May 2006. Retrieved 21 April 2012. ↑ Buckley, Kevin (21 May 2006). "Lippi the latest to be sucked into crisis". The Guardian. Retrieved 27 June 2006. ↑ Dampf, Andrew (12 June 2006). "Pirlo Leads Italy Past Ghana at World Cup". The Washington Post. Retrieved 5 May 2010. ↑ "Italy 1–0 Australia". BBC Sport. 26 June 2006. Retrieved 18 August 2009. ↑ "Lippi dedicates win to Pessotto". BBC. 30 June 2006. Retrieved 25 July 2006. ↑ "Germany 0–2 Italy (aet)". BBC Sport. 4 July 2006. Retrieved 18 August 2009. ↑ "And Materazzi's exact words to Zidane were..., Football, guardian.co.uk". Guardian. UK. 18 August 2007. Retrieved 27 April 2016. ↑ Stevenson, Jonathan (9 July 2006). "Italy 1–1 France (aet)". BBC Sport. Retrieved 18 August 2009. ↑ "Azzurri prominent in All Star Team". FIFA.com. 7 July 2006. Archived from the original on 14 June 2010. Retrieved 18 December 2011. ↑ "Buffon collects Lev Yashin Award". FIFA.com. 10 July 2006. Archived from the original on 12 October 2007. Retrieved 25 July 2006. ↑ "Italy squad given heroes' welcome". BBC Sport. 10 July 2006. Retrieved 18 August 2009. ↑ "Italian joy at World Cup victory". BBC Sport. 10 July 2006. Retrieved 18 August 2009. ↑ "Nazionale, scelto l'erede di Lippi Donadoni è il nuovo ct degli azzurri" (in Italian). La Repubblica Sport. 13 July 2006. Retrieved 9 August 2008. ↑ "Every major nation's lowest FIFA rank since records began". squawka.com. 10 September 2018. 1 2 Francis, Dan (13 June 2008). "Group C: Italy 1 Romania 1 FT". Daily Mail. Retrieved 27 June 2014. ↑ "Lippi returns to manage Italy". TribalFootball.com. 27 June 2008. Retrieved 29 June 2014. ↑ Paul Wilson (24 June 2010). "World Cup 2010: Italy exit as Slovakia turf out reigning champions". The Guardian. London. Retrieved 29 April 2016. ↑ "Italy side looks to slay ghost of World Cup 2010". thelocal.it. 3 June 2014. Retrieved 29 April 2016. ↑ Duggan, Keith (25 June 2010). "Italy out of Africa and Lippi out of excuses". The Irish Times. Archived from the original on 29 March 2015. Retrieved 29 June 2014. ↑ "Fiorentina manager Prandelli accepts Italy job". BBC Sport. 30 May 2010. Retrieved 26 June 2014. ↑ Jackson, Jamie (10 August 2010). "Italy's new dawn fails to rise in dismal defeat by Ivory Coast". The Guardina. Retrieved 26 June 2014. ↑ "Thousands of rioting Serbian fans attack Italian police, forcing referee to abandon Euro football match". Daily Mail. 13 October 2010. Retrieved 26 June 2014. ↑ "Uefa hands Italy 3–0 win after Serbia violence in Genoa". BBC Sport. 29 October 2010. Retrieved 26 June 2014. ↑ "Italy crash to USA defeat". Sky Sports. 29 February 2012. Retrieved 26 June 2014. ↑ McNulty, Phil (24 June 2012). "England – Italy 0–0". BBC Sport. ↑ Taylor, Daniel (24 June 2012). "Euro 2012: England hearts broken on penalties again as Italy triumph". The Guardian. ↑ "Germany 'clearly' favourites, Italian coach says". Toronto Sun. 24 June 2012. Retrieved 26 June 2014. ↑ Arvinth, Karthick (20 June 2012). "'Classy' Germany favourites to win Euro 2012, says Lippi". Goal.com. Retrieved 26 June 2014. ↑ "Euro 2012 analysis: Why Germany could not handle Balotelli and Pirlo". BBC Sport. 29 June 2012. Retrieved 26 June 2014. ↑ "Spain, Germany favourites to win Euro 2012: Dwight Yorke". DNA India.com. 26 June 2012. Retrieved 26 June 2014. ↑ Wahl, Grant (7 June 2012). "Euro 2012 Tournament Preview". SI.com. Retrieved 26 June 2014. ↑ "Spain overpower Italy to win UEFA EURO 2012". UEFA.com. 1 July 2012. Retrieved 2 July 2012. ↑ "Spain 0 Italy 0". BBC Sport. 27 June 2013. Retrieved 28 April 2016. ↑ Pratesi, Riccardo (27 June 2013). "Confederations, Spagna-Italia 7–6: i rigori beffano gli azzurri". La Gazzetta dello Sport (in Italian). Retrieved 26 June 2014. ↑ Dampf, Andrew (20 June 2014). "Costa Rica continues to surprise by beating Italy". Yahoo! Sports. Retrieved 26 June 2014. ↑ Duarte, Michael (24 June 2014). "Italy Vs. Uruguay Results And Highlights: Claudio Marchisio's Red Card Dooms Italy. Suarez Bites Again". Latin Times. Retrieved 27 June 2014. ↑ Ong, Larry (24 June 2014). "Italy vs Uruguay Video Highlights, Score: Suarez, Chiellini 'Biting' Controversy, Diego Godín Puts La Celeste in World Cup 2014 Second Round". Epoch Times. Retrieved 27 June 2014. ↑ "World Cup: Luis Suarez mired in another biting controversy as Uruguay beat Italy". Sky Sports. 24 June 2014. Retrieved 27 June 2014. ↑ "Costa Rica continues to surprise by beating Italy". BBC Sport. 25 June 2014. Retrieved 27 June 2014. ↑ "World Cup 2014: Italy boss Cesare Prandelli to resign". BBC Sport. 24 June 2014. Retrieved 27 June 2014. ↑ "Portugal hand Antonio Conte first defeat as Italy coach in friendly". ESPN FC. 16 June 2015. Retrieved 13 October 2015. ↑ "Italy beats Azerbaijan to qualify for Euro 2016". SportsNet. 10 October 2015. Retrieved 22 December 2015. ↑ James Horncastle (11 October 2015). "Italy qualify for Euro 2016 but are they improving under Antonio Conte?". ESPN FC. Retrieved 13 October 2015. ↑ "Euro 2016 qualifier: Italy recover to consign Norway to play-offs". theguardian. 13 October 2015. Retrieved 22 December 2015. ↑ "Euro 2016, Group F: Belgium, Italy, Republic of Ireland and Sweden". ESPN FC. 12 December 2015. Retrieved 22 December 2015. ↑ "Official:Conte signs with Chelsea". Football Italia. 4 April 2016. Retrieved 14 April 2016. ↑ Horncastle, James (21 June 2016). "Italy's start to Euro 2016 shows you should never underestimate them". ESPN FC. Retrieved 3 July 2016. ↑ Ben Gladwell (24 May 2016). "MLS play cost Andrea Pirlo, Sebastian Giovinco their Italy chance – Conte". ESPN FC. Retrieved 31 May 2016. ↑ "Marchisio out for six months". Football Italia. 19 April 2016. Retrieved 19 April 2016. ↑ "Official: Verratti out of Euro 2016". Football Italia. 6 May 2016. Retrieved 6 May 2016. ↑ "UEFA Euro 2016 – Belgium-Italy". UEFA. 13 June 2016. Retrieved 13 June 2016. ↑ "Eder takes Sweden down". Football Italia. 17 June 2016. Retrieved 17 June 2016. ↑ "Italy: Croatia or Czech Republic?". Football Italia. 18 June 2016. Retrieved 18 June 2016. ↑ "Champions No More! Italy Get Sweet Revenge On Spain In Conte Masterclass". Goal.com. 27 June 2016. Retrieved 27 June 2016. ↑ "Germany vs Italy, Euro 2016: Germans win the shootout after Bonucci penalty cancels out Ozil opener". The Telegraph. 2 July 2016. Retrieved 2 July 2016. 1 2 "Germany finally defeat Italy to stride into semis". UEFA.com. Retrieved 3 July 2016. ↑ "European teams learn World Cup qualifying fate". UEFA.com. 25 July 2015. ↑ "SARÀ VENTURA IL PROSSIMO CT DELLA NAZIONALE". Figc.it (in Italian). Retrieved 22 September 2016. ↑ "Italy: Azzurri flop with France". Football ITALIA. Retrieved 22 September 2016. ↑ "Italy take Israel despite Chiellini red". Football ITALIA. Retrieved 22 September 2016. ↑ "Ogden: Isco superb as Spain thrash Italy". espn.co.uk. ↑ "Ignominious Italy out of World Cup". Football Italia. 13 November 2017. ↑ "Chiellini: 'My last Italy game' - Football Italia". www.football-italia.net. ↑ "De Rossi: 'My last Italy match' - Football Italia". www.football-italia.net. ↑ "Buffon: 'Sorry to end like this' - Football Italia". www.football-italia.net. ↑ "Barzagli: 'End of an era' - Football Italia". www.football-italia.net. ↑ "'This is the apocalypse': Italian press mourns nation's World Cup exit". Guardian. 14 November 2017. Retrieved 14 November 2017. ↑ "Official: Ventura sacked by Italy". Football Italia. 15 November 2017. ↑ "Figc, Tavecchio si è dimesso" (in Italian). repubblica.it. 20 November 2017. ↑ "Tavecchio confirms FIGC exit". Football Italia. 20 November 2017. ↑ "OFFICIAL: Di Biagio for Italy friendlies". Football Italia. 5 February 2018. ↑ "Italy squad for Argentina and England - Football Italia". Football Italia. 17 March 2018. Retrieved 17 March 2018. ↑ "Italy fall to worst-ever world ranking". Football Italia. 12 April 2018. ↑ "Official: Italy appoint Mancini". Football Italia. 14 May 2018. ↑ "Italy: Balotelli and Mancini ideal start". Football Italia. 28 May 2018. ↑ "Italy outside world top 20". Football Italia. 16 August 2018. ↑ "Nations League, Italia-Polonia 1-1: Jorginho risponde a Zielinski". La Gazzetta dello Sport (in Italian). 7 September 2018. Retrieved 7 September 2018. 1 2 3 4 5 6 7 "La maglia azzurra nei suoi 100 anni di storia: tutte le divise dell'Italia" (in Italian). passionemaglie.it. 17 January 2011. ↑ "Italia, la maglia azzurra compie cento anni" (in Italian). corrieredellosport.it. 5 January 2011. ↑ "What Is Italy's National Color?". thoughtco.com. 17 March 2017. ↑ "Eraldo Monzeglio, Maglia nera Nazionale 1935 (formazione dell'Italia schierata e altri momenti dell'incontro)" (in Italian). gianfrancoronchi.net. ↑ "Francia 1938, l'Italia fa il bis a Parigi" (in Italian). adnkronos.com. ↑ víctor pérez. "Brasil-Italia, el clásico del fútbol mundial que consagró el viejo Sarriá". ABC.es. ↑ Paolo Menicucci (22 June 2013). "Brazil v Italy: classic encounters". UEFA.com. Retrieved 27 February 2016. ↑ "CI RISIAMO: ITALIA-FRANCIA Un'accesa rivalità che parte da lontano" (in Italian). federtennis.it. 30 May 2012. ↑ "Storia recente di Italia-Francia" (in Italian). fantagazzetta.com. 14 November 2012. ↑ FIFA.com. "1970 FIFA World Cup Mexico ™ - Matches - Italy-Germany FR". FIFA.com.